US government asks: How much Nutella do you eat? The US food regulator is asking Nutella fans how big a portion they eat, in a row over the average size of serving of the sweet spread. 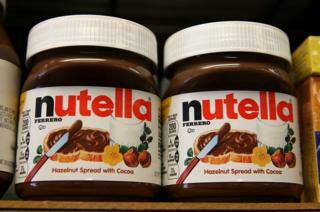 The Food and Drug Administration (FDA) went public after Nutella's makers asked for it to be reclassified. It currently classes the chocolate and hazelnut spread as a dessert topping, with a serving size of two tablespoons. Parent company Ferrero wants Nutella bracketed with jam and honey, with a serving size of one tablespoon. The most expensive Nutella in the world? Two tablespoons of Nutella contain 200 calories - about the same as two slices of bread. The idea that people use two tablespoons comes from the 1990s, when the spread was a popular ice-cream topping - but Ferrero says it is usually eaten on toast nowadays in smaller amounts. In response, the FDA is gathering comments online about how much "nut cocoa-based spread" fans are eating at a time. In a survey of 722 mothers who buy Nutella, Ferrero found 74% ate it on toast or sandwiches. About 14% said they ate it on its own. In the UK and other countries, Nutella jars list a portion as 15g - or one tablespoon. Even if it was reclassified, Nutella would still be twice as calorific as most jams, which contain around 50 calories per tablespoon. Nutella was created by the Ferrero family in the 1940s in the Piedmont region of Italy, which is famed for its hazelnuts. In 1946, young confectioner Pietro Ferrero launched a solid version named Giandujot, or Pasta Gianduja, that had to be cut with a knife. The first spreadable version - Supercrema - came a few years later and Nutella as we know it today was born in 1964, complete with its iconic glass jars. The Ferrero company is the number one user of hazelnuts in the world, buying up 25% of the entire world supply. The BBC asked readers to tell us by email how they eat their Nutella, and how much they get through. Many say they pair the chocolate treat with bread or toast but others favour crackers or crepes as a base. Robin Joy Cintra told us: "I eat my Nutella on toast, I also melt it and dip strawberries in it - and lastly I bake croissants with a center of Nutella." For Lakesha from Kingston, Jamaica, it is best enjoyed with a pear, or a banana sandwich. Janet Pape noted that Nutella was popular spread on matzo, a flatbread eaten during the Jewish Passover holiday. James K Griffin, emailing from Colico, Italy, cast doubt on the approved serving size, writing: "If the FDA conducts a valid survey I think that they will find that the real 'serving size', or amount consumed in one sitting is more like 150 grams, not 15!" Meanwhile, several replies highlighted an unexpected rodent control role for the spread. John Bennett from Northamptonshire explained: "In our household it's usually only one very small portion as it makes exceeding good bait on a mousetrap! I like to think they enjoy their last meal..."